Well, love is clearly in the air with the royal family. 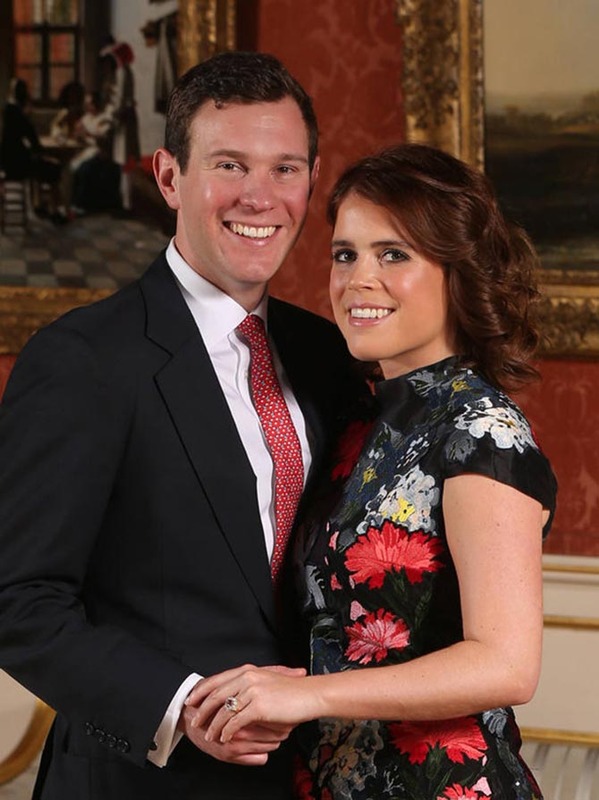 Queen Elizabeth’s 27-year old granddaughter Princess Eugenie is engaged to her long-time love Jack Brooksbank. The formal announcement was made by Buckingham Palace on the morning of January 22, 2018. It was followed by the couple meeting with the press and photographers in the Picture Gallery at Buckingham Palace to talk about the private proposal, that took place earlier in the month in Nicaragua, and the debut of the engagement ring. 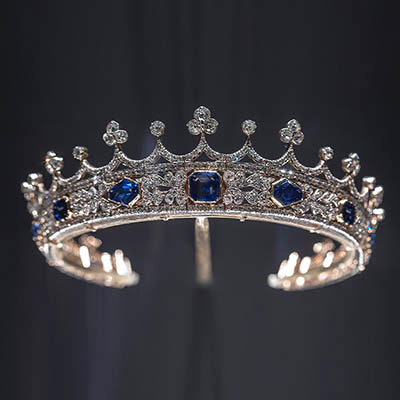 While the vast majority of the coverage has focused on the fact that the ring design resembles the style Princess Eugenie’s mother, Sarah Ferguson, the Duchess of York received from Prince Andrew in 1986 not to mention the most famous engagement ring in the world on the hand of Kate Middleton, the Duchess of Cambridge. Everyone was missing the most spectacular part of the piece. The center stone is an exceptional type of sapphire called a Padparadscha. A term many people stumble over, including the charming groom in the couple’s interview with the BBC. Its pronounced pad-pa-raj-ah. To say the choice is unique is not to remotely express what a special decision it was. 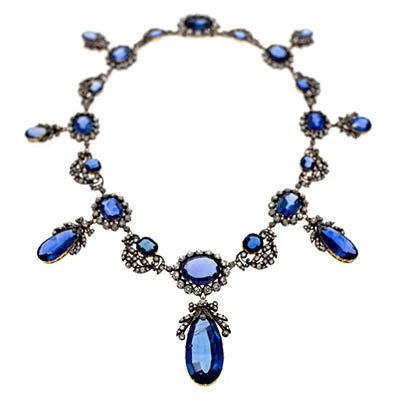 “It’s a rare type of sapphire that resonates with collectors,” explains Angelina Chen, the senior vice president, senior specialist in the jewelry department at Christie’s in New York. “The color is very specific shade of pink and orange and very few sapphires receive the designation of Padparadscha on a gem certificate. The gem quality stones—ones with no heat treatment—can fetch anywhere from $10,000 to $50,000 a carat at auction.” The astonishing figures make the stone much more expensive than most fine diamonds. 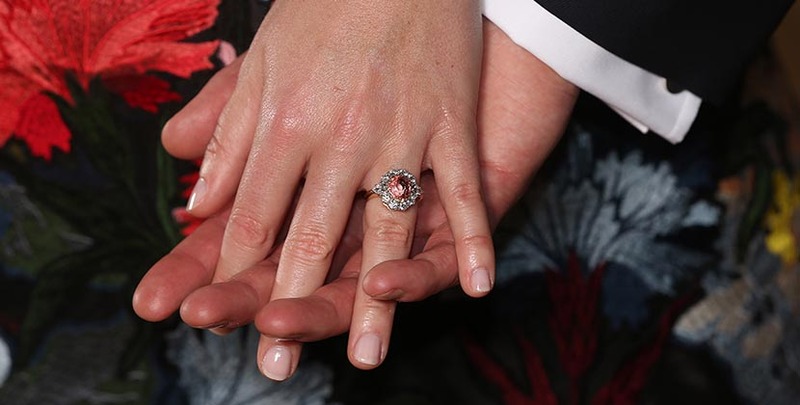 According to the BBC, Jack Brooksbank chose the ring with the Padparadscha “because it reminded him of Princess Eugenie” and “it changes colors in different lights.” When he first saw the piece it only included the Padparadscha, Brooksbank decided to have the diamonds added to the jewel. From the pictures, it looks like there are seven round diamonds surrounding the Padparadscha and two pear-shape side stones set with points facing down. 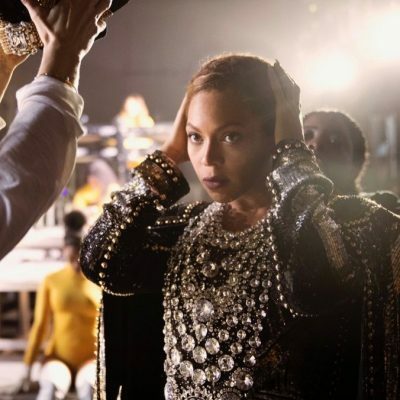 The band is yellow gold and the metal around the diamond appears to be white and could be platinum. 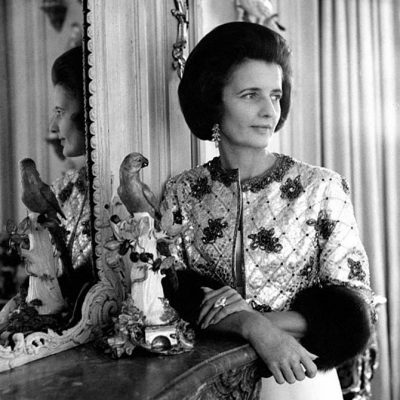 The jeweler where Brooksbank found the piece has not been revealed, which is unusual. While the size of center gems is rarely reported by the discreet royal family, people have guessed the Padparadscha sapphire weighs around 5-carats, making the ring quite a treasure. The couple plan to marry in the fall at St. George’s Chapel at Windsor Castle where Prince Harry and Meghan Markle will be married on May 19.